Stunning home on lake & trails very close to downtown. Too much good to tell --read on! Located on Wonderland Lake nature preserve with a fishing lake, walking, hiking and biking trails just out the door. City license RHL2016-00296. Accommodations for a family of up to 8 or four unrelated renters. We live on a small private street in a lovely neighborhood just a few miles North of downtown. A block to bus line on Broadway are a natural grocery, coffee shop and several restaurants, a yoga studio and more. Our home is spacious, warm, comfortable, informal while elegant, and decorated with eclectic art from our travels around the world. It is large - over 5,000 sq feet. Every room is large, bright and spacious. It is a flexible home and will accommodate a few people without seeming overwhelming, or a several couples or a family. 2 Large, lake view offices are easily converted to bedrooms with high quality, full depth mattresses on conventional height frames. Sleeping lofts in several rooms delight children as sleeping and playing spaces. Parks/playing fields and playgrounds are in walking distance. Hiking and biking trails are literally right out the door. Views of the lake and foothills from almost every room! A swamp cooler keeps our home very comfortable in Summer. The main floor has a living room that opens to the dining room with a table which seats eight. The large airy kitchen has a counter and a comfy corner with a couch and chair and leads to the spacious deck, with dining and couch and chairs and a large hot tub overlooking the lake. This floor also has a 15 x 30 very open 2nd living room which is great for kids, yoga, music and hanging out - there is also an extra very comfy queen size bed here. Laundry and 3/4 bath complete this level. The lower level has a 20x30 bamboo floored room which we have just remodeled with a kitchenette and beautiful 3/4 bath and large deck to the back yard. You can access this from inside the house or via a seaparte entrance form outside. There is a lovely large, comfortable sectional and chairs in one part of the room and a new pillow top queen bed in the other half. Lots of windows and french doors provide lots of light and a walk out to the spacious, fenced backyard.which affords both sun and shade. Additional table and chairs make along with a large grassy area great for quiet and for supervising children. The top floor has a spacious master suite with many windows and views of the lake, a comfortable TV room with an elliptical machine; double pull out couch/bed and loft bed as well as two other large bedrooms rooms with additional sleeping lofts. Large bathroom completes this level. All rooms except the bathrooms have excellent lake and foothill views. The house was remodeled with nontoxic materials and we use natural cleaning agents and organic sheets. We do have a one-week minimum and do not allow pets or smoking. We are not available for weddings or receptions on premises. This is our primary residence and we rent when we are traveling - usually 4-5 weeks in the Summer; 4-5 weeks in the Winter and additional trips as well. 2018 we will be gone for a month in November. Please check our calendar for specific availability. We do like to communicate directly with potential guests to make sure we can meet your needs. We are coaches, leadership consultants and run retreats on skillful relationships for couples. We are also artist/musician/dancer/writer. We are blessed to be able to travel to wonderful places to teach which is why you have the option of renting our much-loved home. Two of our three grown children and our 12 yr and 4-year-old grandsons live here in Boulder. We have lived in Boulder for 33 years and in this home for 30. We did a complete remodel and when we decided not to downsize because there was nowhere else in Boulder we wanted to live and we absolutely love how it looks and feels. We are often told we have the best house and location in Boulder. To be able to see the lake from every window, walk outside, climb the hills and still be just a few minutes from all the action downtown-- it doesn't get better than this! Our home is a treasure we are happy to share. Mornings and evenings in the hot tub watching the changing skies. Dinner on the deck, reading, napping, spending time with friends and family; or off exploring. The views from inside are always reminding us of the beauty of where we live. Our large light-filled rooms offer spaciousness and privacy while also making it easy and comfortable to be together. We are just a few miles form both Downtown Boulder with its famous pedestrian mall and about the same distance to move theaters and other shopping areas. from every room except baths and laundry! Across the lake is the first gentle rise of the rocky mountains. Views of Wonderland Lake from every room and our two decks. Our property is bordered on two sides by Boulder Open Space - land in its natural state, owned and maintained by the City that cannot be built on. Wonderland Lake is a few hundred steps for our door. We keep our cars here when we travel but there is access to trash and recycling and extra house supplies. high speed wireless thorughout house. spices, teas, condiments are available. great speakers for phone or computer hook up in master and both living rooms and kitchen. yes - some great films including some for children and lots of great books around too. large back yard. smaller side and front yards/gardens - nicely landscaped with comfy outdoor furniture. neighborhood pool - possible for full summer rentals not weekly. Walk out to a beautiful network of hiking and biking trails around the lake, up the hills and a longer flat option that goes for miles. A few minutes walk to a great playground and playing field. The lake and surrounding area is a wildlife preserve - deer , coyotes, praries dogs, water and other birds. Lake is stocked for fishing. We really enjoyed this property/home decorated with incredible art and artifacts from around the world. There is a beautiful view from every window, especially the kitchen. Evenings outside on the patio and morning walks around the lake opened and ended each day. The lake, foothills and easy shopping made our time here fly by. The owner is very helpful and has created a perfect meditative environment for even the most frazzled traveler. Boulder, hikes and busy student eateries and activities are down the road 15 minutes. Convenient location to civilization but you would never know it sitting in the jacuzzi watching the clouds float across the mountains. Amazing week in Boulder! Loved this house! We just returned from a terrific family vacation in Boulder! We loved staying at Judith and Robert's beautiful home. There was more than enough space for 2 adults and 4 children and we certainly could have fit more people if needed. I can't say enough about the LOCATION of this house!! The view is absolutely beautiful and there is so much space to run, bike, hike or explore right outside your back door. We loved walking to Lucky's market right down the street and getting food for the house and treats from the bakery. It was so convenient and the quality of the food was excellent. Judith and Robert were very easy to communicate with and they even asked a neighbor to stop by to welcome us and make sure everything was ok when we arrived. They provided multiple local contacts for us, a detailed book outlining the ins and outs of the house and multiple recommendations for local restaurants and activities. Robert recommended rafting on the Cache la Poudre River with A1Wildwater Rafting out of Fort Collins which was phenomenal and all 4 of our kids ages 7-13 loved it!! We also did an awesome Jeep Tour of the Rocky Mountain National Park with Wildside Tours in Estes Park which I would highly recommend! We learned so much and loved seeing the world at above 12,000 feet! We hiked the Flatirons right in Boulder, explored Pearl Street and the University of Colorado. No one wanted to go home when the week was up. We had one of our best vacations ever in Boulder and I'm very happy that we chose to stay at this house because we were very comfortable (also loved the hot tub!) and could not have asked for a better location! Highly recommend! I found my peaceful, happy place at Judith's property! The house is in a wonderful location - surrounded by an informal garden, overlooking a lake and hills, walking distance to an organic grocery store & diner, and minutes from great hiking. For our family of four (including a 3-year-old and 11-year-old), it was also perfect because we were a 10-minute walk to a playground, 30-minute drive to WOW Children's Museum, and within a 1-hour drive to Denver attractions and Rocky Mountain National Park. Being able to balance our busy, sightseeing days with some relaxing, "down-time" at the house made for a memorable vacation! I live in Boulder and was looking for a large home to host my out-of-town extended family, including three small kids. It was the best rental house I have found in Boulder. My family and I had an amazing week at the house. We have had family gatherings in Kiowa, Sonoma, Vail, and other places, but this house was by far our favorite. It has stunning setting along Wonderland Lake and provided the perfect space for spending time together as well as having quiet time to ourselves. The house is spacious and beautiful, but it also has a large deck and numerous outdoor spaces that are perfect for enjoying Colorado weather. The kids especially enjoyed the playroom and the yard. The house is in a great location in quiet north Boulder and has access to trails, including a nice, flat hike around the Lake. It is also within walking distance of a grocery store and small shopping center, including Boulder's best bakery, Lucky's. The house was clean and very well-equipped. Judith was easy to work with and very helpful. The house was a critical aspect our special week together. We loved it, and we want to come back! Beautiful house in a beautiful location. Convenient to downtown Boulder. Plenty of room for 8. A great place to spend a week. We couldn't believe how lucky we were to spend a week here! It truly is a lovely house with a delightful view from the back porch. Every morning, we enjoyed our coffee on the porch overlooking the lake and foothills. So relaxing! There's a wonderful path around the lake and beyond that we enjoyed exploring when we were in-between excursions around the Boulder area. We are so glad you and your family enjoyed our home. 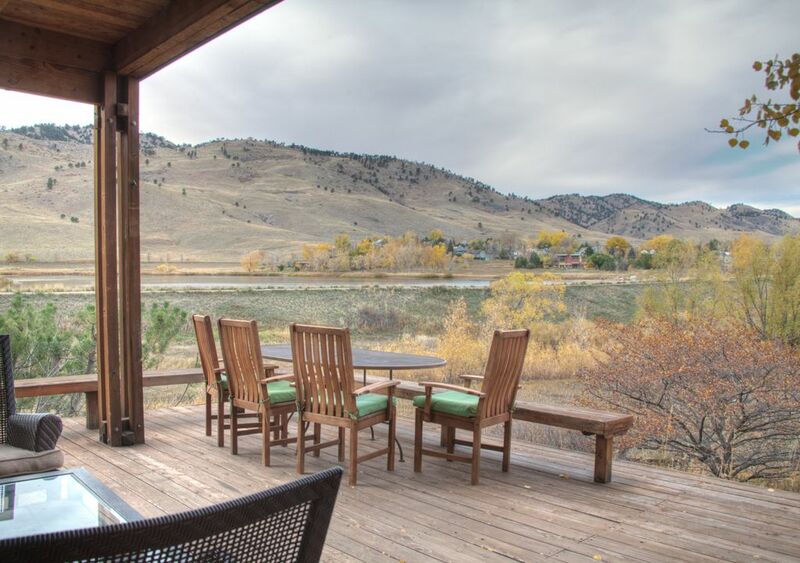 This is truly a treasure of a home and one of the absolute best locations in all of Boulder!. As this is our primary residence we take special care to communicate personally with each prospective renter before confirming online. I want to answer your questions and make sure our home will work well for you. We are licensed with the City of Boulder for short term rentals license number RHL2016-00296 You are free to request alternate check in days tough we cannot guarantee availability. No more than 6 adults and children for $3,500.00 a week. $500.00 surcharge for 7 or 8 guests. The extra guest rate will be reduced to $300.00 in the Fall winter season and will not apply to month long rentals. Maximum remains 8 adults and children.